Shoto Keki ('ショートケーキ', is classified into sweets), is known as Shortcake in English, and 水果蛋糕 (Shuǐguǒ dàngāo) in Chinese. 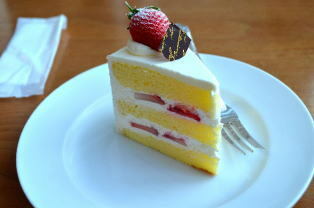 ※Shoto Keki ≒ Strawberry Layer Cake. Strawberry Sandwich Cake or Strawberry Layer Cake. Egg, Wheat Flour, Butter, Granulated Sugar, Whipping Cream and Strawberry (Fruits).